The story centers around Matt Campbell, who is being treated for cancer on a trial therapy in a remote hospital. After seeing the effect the long commute has on Matt, his mother rents a nearby house, which she learns was previously a funeral home. They discover a mortuary room in the basement that they are unable to enter initially, which serverly burns Matt when he attempts to enter. The family begins experiencing violent, supernatural events that the parents first blame on stress and hallucinations from Matt's medications and treatment. 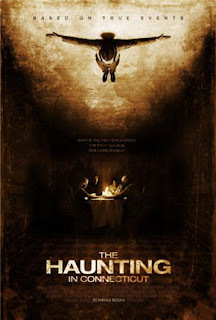 Matt also experiences several disturbing visions of a séance from the point of view of a young man named Jonah, including an intense séance, and witnessing a doctor inscribe runes upon a corpse. After a game of hide and seek, during which Matt's younger brother encounters a badly burned ghost in a dumbwaiter, Matt discovers a box containing a number of photographs from the séance, and spots the boy Jonah he believed he had been hallucinating, as well as a box of human eyelids. They investigate the houses past, and discover the previous owner, Doctor Aickman, conducted séances in the house, using his assistant Jonah as a medium, who convinced many skeptics of his abilities. Doctor Aickman and his guests all died during one of the séances, and Jonah went missing. Matt then contacts a minister, Nicholas, who is also dying of cancer he meets at the hospital to ask for his help. Nicholas hypothesizes that Aickman was performing necromancy on the bodies that he was meant to inter to enhance Jonah's abilities as a medium, and buried coffins filled with sandbags. Nicholas, after initially being driven out by the mother, is called back after the entire family encounters ghosts in a single night, including a electrical storm that takes place throughout the house. After searching the house, Nicholas discovers ashes and a portion of a skull in the mortuary oven. While removing it, the doors and windows begin to slam violently, which abruptly ceases after Nicholas is outside. The same night, the family wakes to find strange markings carved into Matt's body, and he is rushed to the hospital. Nicholas runs off the road after seeing the burned ghost in his rearview mirror. Both he and Matt have a similar vision, revealing that the burned ghost is Jonah, who was killed after the séance by the spirits, who used his abilities as a medium to burn the other guests alive. Matt, after encountering Jonah and learning that he has days to live, breaks out of the hospital and rushes home. After breaking into the house with a fireax, he rushes his siblings outside, and barricades himself in the house. He then smashes the interior walls of the living room, revealing dozens of embalmed corpses. After setting the house ablaze, his mother then comes in to save him, and firemen pull them both out of the burning house, and Matt is revived. Jonah is shown one last time, unharmed, before vanishing. After credits indicate that Matt's cancers went into total remission, and that the Aickman house was rebuilt and resold, with no further incidents reported.